It's often difficult to pinpoint how exactly self-awareness is communicated through music, but when it's there, it's tangible. For Elias Bender Rønnenfelt, it's the factor that allows him to negotiate some pretty dicey territory; a pursuit that marked genre-bending standout tracks from Plowing Into The Field Of Love; his last record with Iceage that boldly traversed cowpunk and brass and piano backed balladeering. 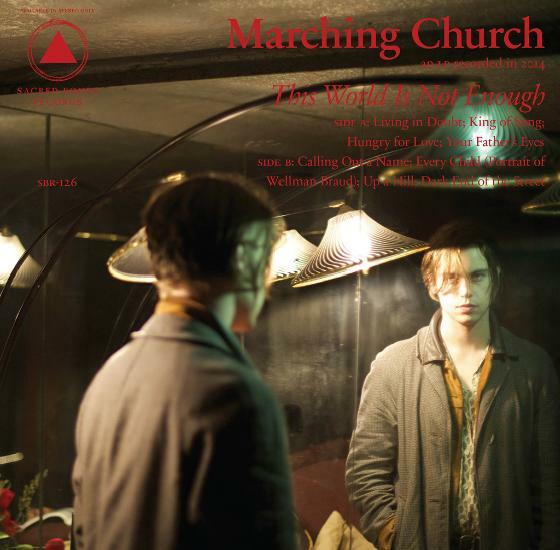 This World Is Not Enough - his new full length record as Marching Church - ventures even further into musical no man's land and still somehow gets away with it. When Marching Church first emerged in 2010 as Rønnenfelt's solo project, Yussuf Jerusalem was probably his closest contemporary; both artists presenting a similarly stripped-back mix of black metal, garage rock, folk and psychedelic pop. Now recently resurrected, the sound has been beefed up and the line-up expanded to include members of Lower, Choir Of Young Believers, Hand Of Dust, Sexdrome and Puce Mary. Along with new bandmates, blue-eyed soul has also entered the equation - while we're used to hearing Rønnenfelt's pained vocals amidst an icy, distinctly Nordic atmosphere; 'King Of Song' is decidedly warm, with jubilant sax and trumpets blazing through the ruckus, reminiscent of a Young Americans-era Bowie. Lyrically, This World often picks up where 'The Lord's Favourite' left off, except now Rønnenfelt sounds even more wistful in his self-aggrandising. When he touts lines like "People will die for me/fantasise about me" with his woeful holler on 'King Of Song' he sounds so far from believing his words that it frames the whole track as escapist reverie masking a more difficult reality. Similar statements such as "I'm still being convinced that I contain some kind of god-like charm" are spat out with disgust on 'Living In Doubt', as if he's scolding himself for entertaining such egotistical thoughts. 'Hungry For Love' is an anomaly; opening with a male voice (not Rønnenfelt's) whispering sensually in Spanish over gentle instrumentation - on paper this might sound like the kind of cringe-inducing territory best left to Enrique Iglesias; however here it's done in such a throwaway manner that it comes off as a wry send-up. As far as comparisons go, Nick Cave might come up a lot in relation to goth rock-tinged, Bad Seeds-esque slow burners like 'Up A Hill' and 'Your Father's Eyes'; however tracks like 'Living In Doubt' and 'Calling Out A Name' also have things in common with Grinderman in terms of their loose, improvisational structures that feel like you're listening in on a jam session; which, according to the press release, is how many of the songs were born. Overall the album pivots on Rønnenfelt's voice; here the songs are opened up way more than they ever were with Iceage, leaving more space around his words. His vocal style might be somewhat polarising when not backed by a dense barrage of noise - and at times This World is a challenging listen - but there is no doubt that broadening his scope has added new strings to his bow; namely the ability to adopt breezier sounds without losing any of his emotional clout.